I do not normally write reviews of computer hardware, but after recently having the opportunity to spend a few weeks in the "real world" with a netbook computer I wanted to publish this post in hope that it may be useful to someone considering a purchase or comparing models. The management consulting firm that I work for has several remote employees who travel extensively. The nomadic travel includes air, rail and automobile, and can be simple day trips or long-term assignments at client offices. I have successfully used a notebook computer for many years in this type of work environment. Typically, the models have fallen somewhere between desktop replacements and almost-luggable units. These have been great at the office or at home, but usually less than desirable at the airport, on the plane, or while working from nomad locations like Starbucks. They were all just too darn heavy to carry around all day (i.e. 6 pounds plus, not including the AC adapter), and too darn big for the airplane seat tray, rental car seat or restaurant table (i.e. full keyboard and 15 inch screens). Therefore, it was decided that we should consider the use of netbooks, and a Dell Inspiron Mini 10v was acquired for testing. Our ace technology manager took delivery and immediately added more memory and installed Microsoft Windows XP Professional and the Microsoft Office Suite of applications. I took it from there. 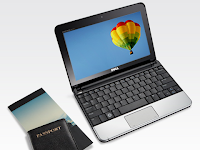 I will try to go through the list of the computer's features and add my comments on the experience that I had while using the netbook in real world conditions for about three weeks. Where applicable, I will also offer my suggestions on how to make the device more useful should you decide to take the netbook plunge. This seems to be the standard processor for the class of netbook machines that are currently available in the retail market. There are some slightly faster processors. For example, the Dell Inspiron Mini 10 has the Atom processor running at 1.66GHz. That doesn't seem like enough speed difference to really be noticeable when there are so many other factors that influence performance. The processor seems peppy enough to be productive with current versions of typical Windows applications. I didn't use a stopwatch, but the observed speed of opening applications and processing simple spreadsheets was quite reasonable. In fact, the Mini 10v was able to accommodate my typical workload of web browsing, email, word processing and simple spreadsheets as good as my more powerful notebooks. The Mini 10v comes with Windows XP Home Edition SP3 installed, but our firm uses XP Professional as the standard operating system so a clean install was made upon delivery from Dell. The Mini 10v had no obvious problems providing the horsepower to make XP Professional hum like it was designed to. 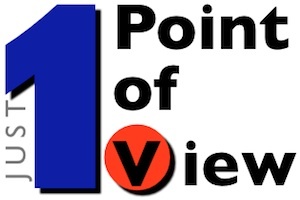 I am not certain that Vista would be a good option for the Atom processor, but based on early reports of Windows 7 minimum requirements, I cannot see the Mini 10v having a problem running the next generation of Microsoft operating systems. Before installing XP Professional, an additional 1GB of memory was installed to supplement the original 1GB, DDR2, 533MHZ in-place as purchased. The additional memory made a big difference on performance. As good as the Mini 10V performed, the combination of the Atom processor and the 2GB of memory had its limits. The Mini 10v operated like a real trooper when you opened no more than two or three applications at once (i.e. Microsoft Word, Excel and Internet Explorer). However, once you opened several applications, kept some resident applications open in the background (i.e. Yammer or Seesmic), or had several browser tabs opened at once, the performance would begin to suffer. When multiple programs were in-use, memory intensive applications like Adobe Flash Player (needed to view on line video from sites such as YouTube) would bring the Mini 10v to its knees. It was difficult to be critically judgmental on the Mini 10v's graphics performance, since the difficulty that the netbook had with displaying Flash animation and video could just as easily been associated with the Atom processor or 2GB of memory. Since the Mini 10v was able to quickly display high resolution, static images in their full glory, I will place the lackluster Flash and video performance on the limitations of the processor and available memory. The small(ish) size of the netbook's screen was not nearly as limiting as I expected it to be. Many of us have become spoiled with extremely high resolution, large-dimension LCD panels, maybe even multiple panels for use with one computer. However, having the sharp-looking 10 inch LCD available virtually anytime and anywhere made you forget about its relatively small size. The glossy finish was a bit of an unfortunate distraction. It produced a glare that was rather difficult to view in the sunlight and bright interior lighting. It also easily showed fingerprints and smudges from normal handling. I would have very much preferred a matte finish, especially considering the mobility of the netbook, its frequent handling and its likely use in locations with bright light. After a few days of use, it was easy to figure-out ways to work around some of the screen size limitations. Even when turning-off unnecessary toolbars in Internet Explorer, the Microsoft browser still took-up too much screen space. We switched to Google Chrome which is much better at maximizing the usable browser screen space. It was also helpful to move the Windows menu / task bar to one of the vertical sides of the screen. It was even better to set the menu / task bar to auto-hide. However, we took it one step further and installed the open source keystroke launcher, Launchy, which eliminates the need to ever have to look at the menu / task bar at all! No real criticism here. The internal speakers are adequate, providing as much fidelity as one would expect from such a small form factor device. The microphone worked surprisingly well for voice and video chat purposes. The combination of the internal web cam and microphone made the netbook particularly useful for voice (and video) over Internet protocol applications like Skype. I recall a day, not that long ago, when having a 20 MB hard drive was pretty awesome. Now as I watch the 5.5TB on my Mac Pro slowly fill with bloated software and space-hungry audio and video files, I find it hard to imagine having less than 500 GB available to work with. However, with a little discipline, the limited hard drive space of the Mini 10v becomes a non-issue. If you can remember that the netbook is not supposed to be a desktop or notebook computer replacement, you can live with not having your entire iTunes library with you (Hey, that's what your iPod is for! ), or too many of your recent NetFlix downloads. Even with XP Professional and the Microsoft Office Suite installed, I had plenty of disk space for most all of my important and current work files (Word documents, Excel spreadsheets and Powerpoint presentations), as well as the last few months worth of email and calendar entries (Outlook PST file). A little diligence here goes a long way, and the standard drive size is more than adequate. The advent of cloud computing comes to the rescue of the netbook users. I made good use of on line storage and sync solutions, such as DropBox to keep my work files synchronized and current across multiple computers. I also played with on line applications a bit. Google Docs seems to have the most complete set of productivity titles that actually work. However, I have not convinced myself that there are not compatibility issues with the Microsoft Office Suite. I believe that Google Docs would be perfect for the user who did not need to share complex, live documents (i.e. heavy use of macros in Excel) in collaboration with Microsoft Office Suite users. Using applications that reside "in the cloud" would likely make the netbook even more productive. The lack of a CD or DVD drive is a non-issue for me. Outside of installation discs, and even that is limited, I cannot recall the last time that I needed to use an optical drive. Between cloud storage and USB drives, I am quite satisfied with access to external read / write storage. Battery life was one feature, or should I say lack-of-feature, that became apparent from the first day that I used the Mini 10v. Fully charged, the 3-cell battery lasted about 2.5 hours in normal, real world use. Add a USB wireless modem and the battery drains even faster. Use an application that hits the hard drive often and you better hope that you are not far from an electric outlet. It's entirely possible that the optional 6-cell 56WHr Li-Ion battery would help extend the battery life to a useful length of time, but the longer battery life comes with the cost of added weight and size (two significant advantages of the standard 3-cell battery). No, this camera is not going to be a replacement for your high-tech digital SLR, or even your mobile phones camera for that matter. However, combined with the built-in microphone, this webcam provides you with a very good video chat device. It is functional and it worked well in my tests with both Google's Gmail Video Chat and Skype. The built-in Wi-Fi capability worked fine, and the range was good for a built-in device. There was no issue with connection quality to a number of different brands of access point devices in various circumstances (i.e. inside, outside, and "noisy" electronic environment). I was disappointed that the Mini 10v Wi-Fi card uses the 802.11g protocol and not the faster 802.11n protocol. Since a netbook could truly rely on the use of cloud computing, Wi-Fi speed could become the bottleneck that determines the ultimate usefulness of the computer. No real surprises here. The Mini 10 offers a HDMI port in-place of the VGA connector. It's my experience that the installed base of LCD projectors in corporate conference rooms has not yet caught-up with the HDMI world, so having the VGA connector means one less adapter for me to carry around. I am fine with that. I was very pleased with the capability of the rather common looking memory card reader slot. What appears to be a simple SD ("Secure Digital") card slot has the ability to accept MMC ("Multi-Media Card") and MS ("Memory Stick") cards as well. Very nice for those who have various types of mobile devices, each of which seems to use a different type of memory card. The three USB ports is somewhat expected these days. In my world, you can never have enough USB ports, and having more than one that is powered would be really useful for when you need to charge-up that iPod and the mobile phone at the same time. Well this is really what the netbook is all about now, isn't it? The small size is really quite amazing. There is a bit of a sacrifice in keyboard size, but Dell has done a nice job of keeping the layout similar to the standard keyboard with no obscure key placements. It took me a short time to learn how to effectively type on the keyboard. I can honestly say that after three weeks I still have some minor difficulty touch-typing, but if I sneak a look at the keys while typing, my error rate drops significantly. At ten by seven inches in size and only 2.5 pounds, carrying the Mini 10v is not unlike toting a small hardcover book. In fact, there were times that I believed that I had forgotten to place the computer in my book bag, which caused me to stop and check. On extended trips, the four pound weight savings from not having to carry the full-sized notebook computer is real; my back and arms tell me so. The diminutive size also prompted me to carry the netbook along with me more often than I would have taken a notebook computer. I found myself toting the Mini 10v along, much like a book. That proved to be quite useful on more than one occasion. For example, I was able to make a last minute change to a presentation while at the printers and send a colleague's misplaced document by email. Yes, it may have been possible to do these same things with my iPhone, but not nearly as easy as it was with the larger keyboard and screen. On a mobile computer, the input device is critical to its usefulness. I have already sang the praises of the Mini 10v's keyboard, so I will be honest here and tell you that I think the touchpad is awful. Maybe I am spoiled by the responsive, multi-touch capable pad on my MacBook Air. Then again, maybe not. I believe that Dell would have been wise to spend more money on the trackpad and less on the colorful shells (the Inspiron series is available in six different colors!). I do not like the textured surface of the trackpad. I do not like the lack of responsiveness. I do not like the trackpad buttons being "built-in" under the surface of the trackpad itself. I cannot see a market research effort revealing that a test group found this input device satisfactory. Since I really like the Mini 10v overall, it is my hope that Dell will correct the trackpad matter in future versions. The Dell Inspiron Mini 10v is a very good netbook computer. Through my real world use, I have found that the netbook device would not be a very practical replacement for an existing notebook computer for most users. Rather, I believe that the netbook makes a formidable compliment to a mobile user's notebook computer. Save the notebook for the processor and graphics intensive applications that make up the minority of your computing requirements, while using the netbook when on the road to stay connected to the world and to get the majority of your more simple computing tasks completed in a much more convenient and practical manner. Thanks for a great overview. One problem I had with the Inspiron 10V that after spending two hours I could not get it to work with the internet modem. I am thinking that I have to buy a network card I am not sure can you please help.